You are here: Home / Welfare / Raise your VOICE for the VOICELESS! Support THEM! Raise your VOICE for the VOICELESS! Support THEM! Voiceless India is a campaign which has been initiated to spread awareness about animal cruelty related issues such as animal testing, animal slaughter, abuse on streets, hunting, etc and support animals across the world. Here’s more on this noble move. Animals are those souls who have a voice but remain unheard; therefore we call them the VOICELESS. They try to communicate pain, fear and love, but are ignored. They have a right to live a life without facing brutality but instead they die in vain. We need to give them our voice to make them heard. Voiceless India has initiated bedding and feeding programmes for animals all around Noida, which involve providing comfortable beds to strays and giving them food. We are working in sector 119, 120 and 121 as of now and will increase our reach as more volunteers enroll themselves in. Animal activism is a social work field which has come up greatly in the last few decades and I would call it one of the most important areas of social welfare in today’s world. The world we live in is a world made by humans which includes massive architectures, speeding cars, plastic waste, etc. so why should ANIMALS bear its negative consequences? Why should elephants and pandas not have a home because we want buildings? Why should dogs die under speeding cars because we want to reach far-away places on time in the most luxurious way possible? Why should birds choke on plastic garbage which we have used for our benefit and thrown out in the open? Why should anyone suffer from the undesirable effects of the human world but humans? Stray dogs are the most amicable, expressive, understanding and loving breed of dogs and make the best companion one can ever have. They have the ability to make you smile in the darkest moments of your life and share the joy in the happiest ones, when you want to express yourself freely, but then why do they don’t deserve a home? A stray has gone through horrendous situations during his lifetime in the loneliest fashion which instills in him the strength, understanding and sensitivity to understand others. Humans claim to be the most intelligent, caring and sensitive creatures to walk the planet but how often do they find these beautiful words in their daily actions? Animal activists from all around the globe protect animal rights and some are trying to bring them better conditions under which they live or work, but this is not the only way you can help animals. Easier ways exist and there is a long list, some of which are – giving stray dogs food around your locality, getting some blankets or mattresses made for them to snuggle in and sleep cosy in the winter, helping them find loving and adoring homes or volunteering in the nearest animal shelters. Spread awareness about animal torture, cruelty and welfare amongst your Facebook friends and others. Collect information and basic knowledge about animal cruelty related issue to educate and inform the younger children in your locality by conducting informal or formal workshops. Animal welfare NGOs like PETA have exposed so many rackets which reveal horrific truths of animal testing. It might be difficult for you to stop this, individually, but you can speak up against these practices by signing petitions which call the governments of many countries to put and implement a legal ban on them. Why do humans need products tested on animals which can be tested in simulators and on other substitutes giving more accurate and reliable results? I call for a planet which is free from all sorts of animal torture and one which moves towards being compassionate and sensitive in actuality. Mahatma Gandhi rightly said, “The greatness of a nation and its moral progress can be judged by the way its animals are treated”. 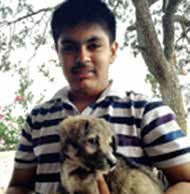 (Ankit Puri is a social activist and very passionate about animal welfare and fighting for animal rights. He’s a student of XI Class at Step By Step School, Noida. Volunteers are welcome to support ‘VOICELESS INDIA’ by assisting their programmes. For detail,contact at: 9999515003). http://www.dogsandpupsmagazine.com/wp-content/uploads/2016/01/Untitled-3-1.jpg 130 230 Dogs and pups Magazine http://www.dogsandpupsmagazine.com/wp-content/uploads/2017/05/1254nal.jpg Dogs and pups Magazine2016-01-16 12:47:242016-01-18 17:45:51Raise your VOICE for the VOICELESS! Support THEM!